Had a lot of fun working on all the little details for Henry’s 3rd birthday party – hee haw! Little Henry turned 3 this past weekend – so it was time for his white shirt photo. Hoping to have a little flip book of him growing into his white button down when he turns 18. September 5th – my “lion tamer” tee will be featured on kid independent. 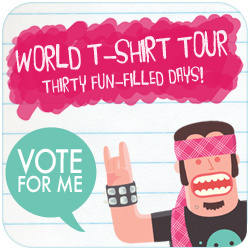 please vote for Tweet!! yay!